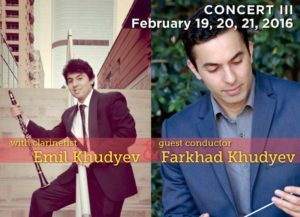 This much-anticipated February program opened with the short, powerful and astounding world premiere of Khudyev’s “The Sounds of Eternity.” Both an intimate musical self-portrait and an unflinching reflection of the human condition, this composition weaves together elements of Khudyev’s childhood growing up in Central Asia’s Turkmenistan with a transcendental message about finding joy in the midst of hardship and change. But it was Beethoven’s “7th Symphony” where the greatest revelations came. Khudyev’s leadership of this celebrated symphony gave us, in an absolute and electrifying way, a summation of exactly why professor Vitek so powerfully commanded that his gifted violin student change musical careers. Khudyev embodied Beethoven. He was on fire! Every movement and every gesture came across as true, powerful, ecstatic and utterly riveting. Everyone in the Sunset Center — conductor, musicians and audience — became part of a single experience that left us all shaken up in the best possible way. Yes, the beautiful and famous allegretto movement glistened with majesty and delight, but so did all of it. Khudyev possesses a magician’s ability to connect with invisible worlds and to bring them alive in the music. And somehow, some way, he and Beethoven have been having great conversations. The Monterey Symphony audience was fortunate enough to have heard this one.